Nikki Hoier is an alumna that holds not one, but three degrees from Florida Tech, including an M.S. in engineering management and a M.S. and Ed.S in science education. 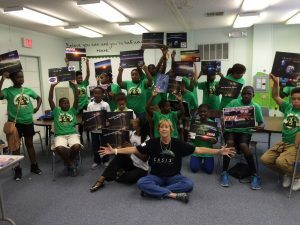 She is currently the STEM Education Specialist for the Center for the Advancement of Science in Space (CASIS). Through her work, she is building K-12 citizen science programs utilizing the International Space Station as a learning platform. Tell me a little bit about yourself. What are you passionate about? I love to learn. I love the ocean and have been putting artificial reefs offshore Sebastian Inlet since 1998, using old cement railroad ties. Sustainable development is my passion and teaching kids how to do things themselves has always been a passion. Repurposing things into something useful or something artistic. I love Space. The unknown. I now work for CASIS, Center for the Advancement of Science in Space. I am part of the STEM team and we promote Science and Engineering, using the ISS National Lab as our platform for research. It is our gateway to deep space! Research in Microgravity (no gravity) has great promise for the betterment of life on earth. We get kids involved in research projects and some of our teams’ projects get to fly in Space! Life is awesome. I get to experience the joy kids experience—that means girls and boys…..yes GIRLS!! When they learn how totally cool the art of science and engineering is. It was a natural progression. I studied Art first, then English in grad school, then a Masters in Science Ed., then an Ed.S in Science Ed. Using my artificial reefs as my study focus, then 10 years of research that involved a lot of FIT students and a lot of diving, then an M.S. in Engineering Management. Now it is Space. Mars or Bust! Women are just as smart as men and well-suited for details. Women also have patience…….a lot of it. Women still face male dominated science and engineering fields—attitudes and lower pay. I say put your head down and keep swimming. Every successful woman is one more step forward for equality. The best way to overcome anything is to do your best and live well. Never give up. Just keep going forward against all odds. Trust my inner self earlier. If a little voice is telling you something, listen to it! You gain wisdom in many ways. I would say DO IT!! It is awesome and it is wonderful! The more you learn the more you realize you do not know! The field is finally growing and the women you meet in STEM are wonderful! I think the STEAM movement is very important. Art is the universal language of culture. Art is the glue that brings science and engineering together.